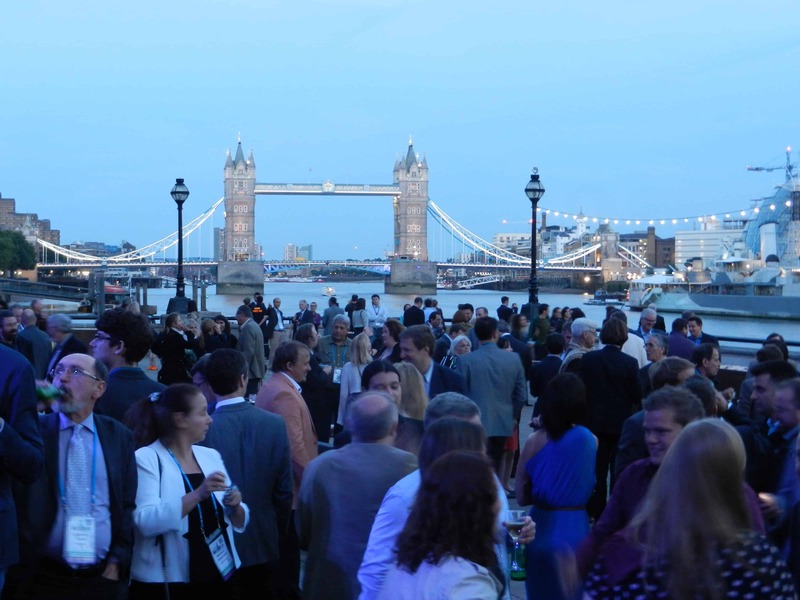 Last night I attended a gala function at the Old Billingsgate Market, apparently at one time the world’s largest fish market. World’s largest? How on earth do they measure such things? Anyway, it was from this point that the Macarthurs left London forever. ‘I took leave of my friends in London’ began Elizabeth Macarthur in her journal, ‘and accompanied by Mr McArthur, hired a Gravesend boat from Billinsgate [sic], which conveyed us to the Neptune’. It is a quiet beginning to what would become a tumultuous and harrowing journey. The Macarthurs, with their eight month old son and his nursemaid, stepped into their Gravesend boat on a cold and wet Friday 13th November 1789. From the bustle of the markets at Billingsgate to the Neptune’s quiet anchorage downriver at Longreach was a trip of some seventeen or eighteen miles. 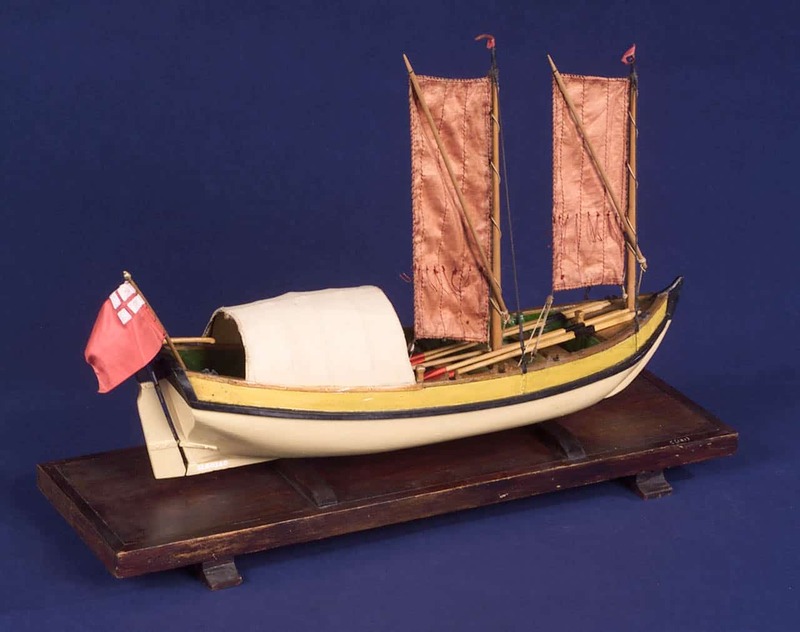 A Gravesend boat was a small sailing vessel, about eighteen feet long, used to carry passengers and cargo up and down the Thames. Strong winds could see waves breaking over the boat and drenching all within. To help prevent such soakings, the rear half of the boat was covered in a large canvas tilt stretched over a curved frame, not unlike the covered wagons of the American west. Here the Macarthurs could sit, out of the rain and looking at riverside London, wondering if they would ever see it again. Daniel Defoe, author of Robinson Crusoe, also wrote about Gravesend Boats. In his view the men who crewed the boats were insolent and too full of bravado. In bad weather, according to Defoe, they would deliberately put the boat at risk – particularly if the passengers were timid or complaining. In one such case Defoe claims fifty-three people drowned as a result. But if the passengers remained nonchalant (or pretended to be) then the boatmen behaved with appropriate care and safety. But the old market buildings in which I enjoyed myself (with about 1000 of my closest friends – it was less gala and more galah) are not quite old enough. 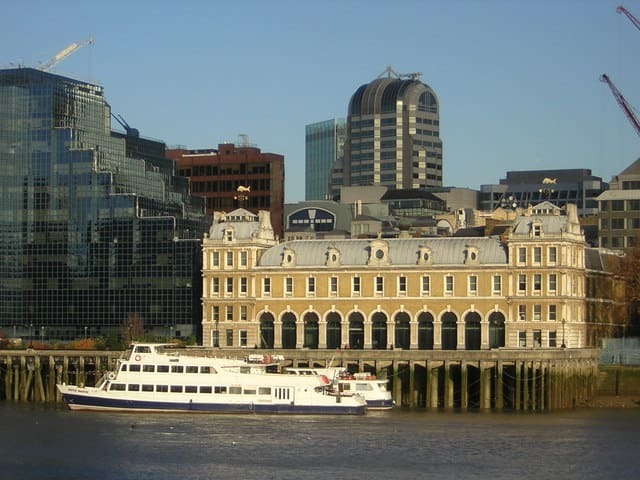 The first Billingsgate Market building was constructed on Lower Thames Street in 1850 and the existing fish market was moved off the streets into its new riverside building. This was demolished in around 1873 and replaced by an arcaded market hall in 1875, the building that still stands on the site today and that is pictured at the top of this post – did you note the fish-shaped weathervanes? The markets are now a hospitality and events venue: you can see inside here.